Crafted by Lakme Salon experts, this gel facewash is infused with soft cleansing beads and lemon anti-oxidants, known to freshen skin. It gently cleanses your skin and effectively washes away dirt, impurities and pollution, leaving your skin with a blush-like glow. Add a hint of fruit tint to get beautiful skin with the new range of Blush and Glow facewashes from Lakme. Fruits rich in anti-oxidants are rich in color. Lakme salon experts have developed a way to add beads of Lemon anti-oxidants to cleansers. The rich anti-oxidants from lemon burst to add natural color to your skin each time you wash your face. Lakme Blush and Glow facewashes, keep them guessing what is making you beautiful. Use the Lakme clean-up nourishing glow face wash and get rid of dead skin, excess sebum and other impurities in an instant. It effectively cleanses your skin to give you that radiant and healthy glow. 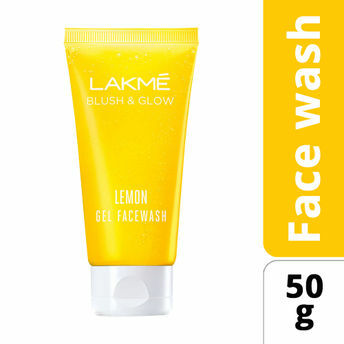 Enriched with the natural goodness of lemon, this face wash nourishes and rejuvenates your skin. This creme-based face wash is rich in fruit anti-oxidants (lemon extracts) that keep your face feeling fresh, youthful and maintains your skin?s natural glow. Enriched key ingredients like rich lemon extracts, anti-oxidants and beads, Lakme Blush and Glow Lemon range is ideal for everyday use and keeps your skin clear of all dirt and impurities. Explore the entire range of Face Wash available on Nykaa. Shop more Lakme products here.You can browse through the complete world of Lakme Face Wash .Alternatively, you can also find many more products from the Lakme Blush And Glow Lemon Gel Face Wash range.